The Daily Vote – Do Liverpool fans deserve better than Hicks & Gillett? Yep, it seems most Liverpool fans would be happy to ditch their ‘Yank’ benefactors, Tom Hicks and George Gillett â€“ if only because they could then return to baiting Man Utd fans about the Glazers. Even Steven Gerrard voiced his concern about the state of Liverpool FC last night, after his side drew 2-2 at home with Aston Villa – a result that virtually guarantees another season without the league trophy going to Anfield. From the outside, it’s impossible to know who to blame here. At the end of 2007, it became clear that Rafa Benitez was very agitated by the way he was being treated â€“ or the way he perceived he was being treated – by the Americans. Hicks & Gillett have never gone out of their way to back Benitez, at least not in a convincing manner. If anything, they have undermined him â€“ it was folly to state publicly that they had considered bringing in Jurgen Klinsmann as head coach, even if privately Rafa had said he might leave. 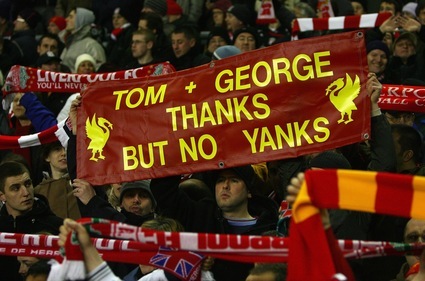 That was the moment when many Reds started to see their owners in a negative light. Since then, they have rallied around Benitez. He may be flawed as a manager, but he is their flawed manager. Rafa is a Red, and I don’t believe that Hicks & Gillett understand how much that means. In my opinion, Hicks & Gillett have underestimated Liverpool Football Club from day one – they had little idea what they were getting themselves into. The club is much bigger than any individual.